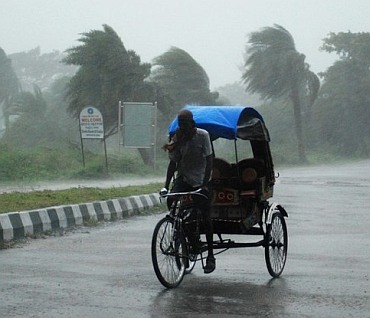 Rediff.com » News » Cyclone Hudhud? Really? What does that mean? Cyclone Hudhud? Really? What does that mean? How can a cyclonic storm that could make landfall at India’s eastern coastline with winds blowing in the range of 120 to 140 km per hour be named Hudhud? A Google search of Hudhud throws up this definition of the Omani word: ‘Hoopoe, the bird which carried the letter from Nabi Sulayman alayhissalam to Bilqis, the Queen of Saba (Sheba)'. The India Meteorological Department, which is a regional specialised meteorological centre recognised by the World Meteorological Organisation, has the mandate to provide weather advisories to seven countries -- Bangladesh, the Maldives, Myanmar, Oman, Pakistan, Thailand and Sri Lanka besides India. It also asks these countries to suggest names for the cyclones, which are then listed in an alphabetical order of the names of the member countries. was the turn of the Omanis who picked Hudhud to identify the northern Indian Ocean cyclone. The main north Indian Ocean tropical season runs from May to November. The convention of naming cyclones dates back to the early 20th century when an Australian forecaster named major storms after politicians he disliked. While the US weather office started giving names to cyclones in 1953, the trend began in the sub-continent in 2004. Whatever be the logic behind giving the cyclone such a name, it certainly makes lighter vein of its severity. The next cyclone in the northern Indian Ocean region will be named Nilofar by Pakistan followed by Priya (Sri Lanka) and Komen (Thailand). Will army's flood relief operations win over Kashmiri hearts?